All issues of the Canadian Flyer feature: President’s report, door prize and raffle prize winner photos, upcoming events & club meets, Editor’s corner and always a few surprises! The April 2019 edition is the latest. Enjoy it now! In this issue: March brings Spring and a picnic lunch. Mark Horne arrives straight Out of Africa, with pictures of the Victoria Falls Dinner Train – and others! COOTTS coverage from April meet; Bob Garton with steam and diesel identity plates; You CAN take it with you ! Building a layout in a mobile trailer, by Ed Santor. White Pass & Yukon renovations – part 2, from Tom Modica. Annual Bus Trip to the Great Train Show in Puyallup Jan 19. CTTA members Gordon & Kyle at Squamish for Polar Express. Mark Horne open house operating session Dec 26. Paul Curtis layout corner. From the East – David, Robin and Richard. In memorium, member Bruce Fowler. Altoona Salad Collage by Tom Modica. Bus trip to Puyallup Great Train Show pics. Collecting Trains: An Appreciation, by John Constible. John transitions his layout to Standard Gauge. Happy 12th Anniversary: Sid & Olivia, Gary & Katelon. Jim Barret’s 4-rail prewar American Flyer. White Pass & Yukon refurbishment tour & at Skagway; Tom, Mark & Gary. From the Archives – a new feature! Treasure finds and oddities. The Xian Warriors by overnight train – a feature by Frank Schmidt. MTH White Pass & Yukon reefer Club Car announced. Last call for the bus trip to the Great Train Show in Puyallup, WA. 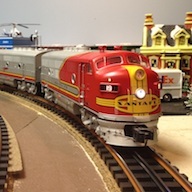 Pics from from November meet, WCRA Polar Express and member’s submissions. Jorge Beristain Sicamous Station model. A.C. Gilbert Erector set #9 for sale. 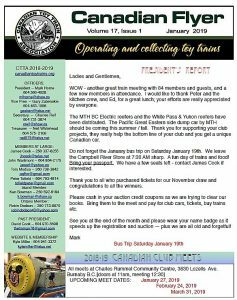 Auction and table sales process reminder; Monroe, WA show; Alan Cruickshank tribute; Jim’s 100 year old Lionel train; Puyallup, WA Great Train show in pictures; Oregon Rail heritage Centre in Portland; MTH White Pass & Yukon reefer Club Car available to order; Pics from from January meet; Visit to Zurich with Mark Horne. Trains galore! Local shows see Mark in Denver and Robin in Ontario. Sights of RS-3 #561 and Swiss engineering. MTH White Pass & Yukon reefer Club Car available to order; Pics from from January meet; Visit to Zurich with Mark Horne. PGE Cranes seen in action on member layouts. PGE RS-3 diesels have arrived. Fun with your model railroad circa 1949; Western rails 2018 in Burnaby; TTOS PNW in Bellingham; Atchelitz Threshermen layout in Chilliwack; Thomas Madsen’s custom built WP&Y Alco locomotive; A gallery of Japanese Trains. PGE RS-3 diesels delivered. Announcing a second BC Electric reefer from MTH, this one in green. Hornby for Canada, Frank Schmidt. Great British Train show in Ontario, Robin Dodson. Calgary Supertrain, Gerhardt Klann. Rod Hugh Erector set builds. Classic CP coaches. Overdue MTH BC Electric (yellow) reefers arrive. Order your upcoming Green BC Electric reefers now. Welcome Tom Mower from Quesnel! Day out with Thomas and PGE RS-3 diesels in Squamish. Earl Labounty’s nice layout and super backdrop. Lionel service bulletin for recent Mogul release. Flyerholics video from Ed Stephens. Wacky trains to model. Annual General Meeting and Fall BBQ. BCE green reefers and WP&Y reefers shipping soon. Robin Dodson’s B-day present, and new train room; Trains n’ Brains; Alberta Freemo in HO; Dan Gory & friend in Cranbrook; Kyle with engines big & small in Squamish. Annual General Meeting, BBQ and election of officers. Layout Corner – Gary and Katelon Zabenskie. Mount Cheam Lions train and hobby show (Chilliwack). Vancouver Train Expo. Great Train Show bus trip. Jorge Beristain Sicamous Station in O gauge. Russian train crash video from Terry Berg. York group report and pics; BCE green reefers are here and WP&Y are on the way; special deal for members on upcoming PGE side dump car. CTTA at Vancouver Train Expo. Report from the East – David, Robin and Richard. Bus Trip to the Great Train Show in Puyallup Jan 19. Upcoming auction items from Bill Stephenson collection. Video link for railway snowplough fanatics, photo link for historic PGE and BR rail passenger services. Club Car order forms for new Atlas O diecast PGE 2-bay Hopper & MTH BCE Reefer. CTTA member Frank Schmidt tours the Marklin factory in Germany. Williams O scale 44 ton switcher released in classic Canadian National green and gold. Last call to order PGE hopper from Atlas O. Pics from World’s Greatest Hobby train show and CTTA bus trip to Puyallup, WA. Christmas trains at West Coast Railway Heritage Park. Looking for Mamook Models signs. Martin’s Christmas prize. Jim Southerland layout corner and Family Day layout action in Colwood. COOTS update. Children win at the meet. CPR Yoho station scratchbuilt by Jorge Beristain. Clark Gray recalls beginnings of Canadian Division & 1980s photo. Dave Cook in St. Catharines, ON. Tribute to Ted Diakow. Mamook Models signs. Kitbash Corner from Charles Reif and Dan Gory. 44 tonners. Tinplate workshop restoration, John Constible. American Flyer set box show & tell – ‘The Wrong Christmas’, by Frank Schmidt. In memory of Gunther Sage. Whodunnit part 2 – more handcrafted billboards. Gunther Sage estate sales and donations to the club. Jorge Beristain scratch build of CP Yale portable passenger station. Dan Gory kitbash conversion of MTH CP F3 to F7. Layout projects underway from Mike Munk & Kyle Miller. Vancouver Island group layout action at Buccaneer Days in Esquimalt. Other treasures sought and found! Join us for our annual Summer BBQ at the June meet before we break for the Summer. Kit bash special – the first dome car? 2017 Club cars are SOLD OUT! Other treasures sought and found! 2017 July CTTA Canadian Flyer – Canada 150 edition! Our annual Summer BBQ at the June meet was a hit. Announcing our 1st locomotive project – an MTH Pacific Great Eastern RS-3. Special member deal on a PGE Crane car. Hornby trains in Glasgow – Jim Barrett. COOTTS Marches on – meeting dates. The beginnings of rail container shipping. If Trains Could Talk – feature article by Frank Schmidt. Notice of Motion for Annual General Meeting. 2017 Club cars from MTH and Atlas O are on their way. New trains in Hawaii, Stu Jackes. Greetings from the countryside, Ian, Vies and Robin. The Canada 150 train – Vintage CP FP-7 A-B-A in Port Moody with Kyle Miller. At ease Sailor! – Fred Webb retires. A visit to the heavyweight Venosta and the Port Moody Station Museum, by Kyle Miller. Link to diecast vehicles, Tom Modica. Annual General Meeting, BBQ and election of 2017-2018 officers. 1st batch of 2017 Club cars from MTH have arrived, Atlas O hoppers have arrived. Words to live by. A Canadian accessories mystery solved, follow up from June 2016, Lee Weir. Tinplate prototype, Robin Dodson. BC historic train collection in jeopardy. Links to MOW equipment pics and historic Arbutus line video, Tom Modica. Vancouver Train Expo! Gord Hall is featured in the Vancouver Sun. Pictures and treasures from York. American Flyer ‘O’ set show & tell, Jim Barrett. January bus trip to the Great Train Show in Puyallup, WA. Photos from other fall shows & events – CN Family Day, WCRA Mini-rail, Mt. Cheam Lions Club, York. COOTTS meet Dec 3. British Steam video. Help solve the Mystery Platform. Lots of Christmas door prize winners. Puyallup bus trip pics. Coots meet. Moving Port Moody station down the tracks. Live steam days in Germany. Peekaboo streamliner. 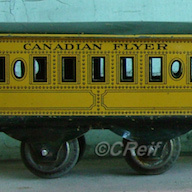 John Clifford’s fanciful handiwork and custom trains. About multiple-chime diesel airhorns. Unexpected tin-plate finds in Victoria. Order forms for B/A ‘bowtie’ logo tanker and E&N 36′ woodside reefer CTTA club cars. Bitter Creek Western live steam meet video. Stu Jackes weathering and painting. Pics from Museum of Transportation, St. Louis, MO. Passing of ‘Sir Handy Boo Boo’ Robert Hammond. Neil McKenzie’s prewar Hornby O gauge gets the white glove treatment. A chocolate train arrives in time for Easter. Tom Mower’s layout in Quesnel. Layout corner: John Constible’s collection. Return of the Flying Scotsman. CPR locomotive types. TOFC possibilities, Peter Tofield. The Million Dollar Hobby Railroad. Last call to order 2016 Club Cars : B/A bowtie tanker and E&N reefer. Ed Stephens models some extremely collectible American Flyer wear. Great Water Fight ended railway venture into Bellingham. Atlantic Coast Line railroad museum pics by Mark Horne. Ferrocarril de Santa Ria coaches pics from Did Ball. Scratchbuilt model of the Boise Depot by Jorge Beristain. Last call to order 2016 Club Cars : B/A bowtie tanker and E&N reefer. Club Car report: E&N Reefers from MTH sold out. B/A Tankers from Atlas O, just a few left. Lots of unusual and interesting tinplate at the meet – photos. Honolulu HART – update from Stu Jackes. Nanaimo CP Train Excursion. Wallace B. Chung historical collection of Canadian Pacific, Chinese immigration and Government artifacts, a free exhibit at UBC. Story and pictures by Kyle Miller. Steam loco mishaps. Meet our newest member, Conductor Carl. Robin’ Dodson’s pics from the National Railway Museum in York, UK. Tom Modica trackside pics from Rome. Island Group layout in action at Esquimalt Buccaneer Days and Victoria train show. MTH Esquimalt & Nanaimo Club Car has arrived! John Constible finds a super rare 1660 crane car in prewar set 8040. Toy Train track museum. Whodunnit of Canadian tinplate accessories from Lee Weir. Notice of the CTTA 2016 Annual General Meeting (AGM) and election of executive. 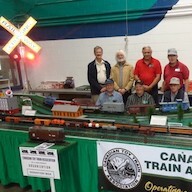 Bruce Fowler hosts TTOS NWD meet and shows his Hornby layout & collection. Highlights from Kyle Miller’s trip to the Canadian Railway Museum in QC. Upcoming events. Executive returns after AGM election. CTTA bids farewell to member Bill Stephenson after more than 40 years in the club. Club Car announcement, new Atlas O diecast PGE 2-bay Hopper. Plans updated for annual bus trip to Puyallup. Highlights from CN Family Day at Thornton Yard. Link to Lionel Customer Service videos. Pics from Lynden show, Kyle Miller’s trip to the Toronto Railway Museum. Upcoming events. Club Car announcement, new Atlas O diecast PGE 2-bay Hopper. 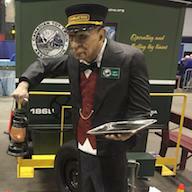 CTTA members travel to TCA Eastern Division YORK, PA train show. Pics from there and Steamtown at Scranton. Remembering Frank Teoli. Father John retires. CTTA layout and Gord Hall layouts at Vancouver Train Expo. Dave Cook at the Ontario train shows. More Bill Stephenson collection items at auction at the November meet. – New CTTA Web site update, call for pictures. Puyallup show update & pics. COOTS in Nanaimo. Gord Hall’s layout at WCRA Polar Express event. Passing of Roger Frisson. CPR vintage sign. European Tinplate Update – Michael Holzschuh. David Cook & Gail Ferrier report from the Eastern Front. – Rare pre-war trains available at auction. Vintage transfer table photo. Layout corner – Charles Reif. Layout corner – John Constible. 6 questions. Mystery car – O gauge Pay Car. – Munroe show layout pictures. Big diesel power. Darth Vader Train. Calgary ‘Supertrain’ show exhibitors list. Pennsy adventures in railroading, rubber tired switchers. Tinplate in Bad krozingen, Michel Berthet. – Web site workshop and call for pictures by Kyle. Fall “Cameron show” – Vancouver Train Expo – relocates to PNE. Cal Stewart North report and pictures. Announcement BC Rail RDC cars by Sunset models / 3rd rail extremely limited run. The origin of US standard railroad gauge. Vancouver Island group layout photos. CTTA Spring Club Car, a Weaver Canadian National Railway flatcar with a White Pass & Yukon Railway trailer. David & Gail’s Excellent Adventures in Ontario – the Kitchener Toy Train Show at Bingeman Centre. Club Car update for the Weaver White Pass & Yukon Route TOFC and Sunset/3rd Rail BC Rail BUDD cars. Nickel Plate Berkshire #765 keeps on truckin’. TTOS Island Group history, 1980’s at Bill Stephensons. Steam in China, videos from Hami. John Constible’s Standard Gauge ‘Wall of Trains’. Prize and auction preview for June COOTS meet. Charles Reif’s BC Railroads survey. World’s simplest electric train. 1st delivery of Weaver White Pass & Yukon Route on CN TOFC Club Cars to members. There’s still a few available for order. David Cook’s report from the East. Show & Tell: Bill’s paper tunnel; Neil Whitehead’s kitbashed postwar articulated giant; Vies’ collection of evolving Marx 333 steamers. Bing ‘The World Flyers’ toy. Nanaimo report and pictures. (COOTS meet). News FLASH – Weaver to close. PGE Caboose Artwork update. Weaver White Pass & Yukon Route on CN TOFC Club Cars delivered to members. The disposition of Weaver assets. Frank Schmidt’s wind up Marx Easter Bunny Train. David Cook’s report from the East, Halton County Radial Museum on the Grand River, Ont. Oceanic Tank Cars ? Sheyern Monastery, Bavaria, display. Aug 7 – 12, Old and New; submitted by Michel Berthet. Fall meeting BBQ. Annual General Meeting – election, presentation of budget and adoption of updated CTTA resolutions. Update to e-mailing policies and creation of opt-out list for promotional messages. Weaver White Pass & Yukon Route on CN TOFC Club Cars SOLD OUT. MTH PGE caboose ands Sunset/3rd Rail BC Rail Budd Cars expected in November. CTTA places 2nd at Lynden show. Stu Jackes’ model building services. Lynden, Chilliwack and Vancouver PNE train show photos. Report with pictures from CTTA group trip to York. Mark Horne Open House Dec 1, 2015. Order forms for B/A Bowtie Tanker and PGE Caboose. Report from the East – David Cook. All issues of the Canadian Flyer feature: President’s report. Door prize and raffle prize winner photos, Upcoming events & club meets, Editor’s corner and always a few surprises!